Watch the Video About Us. Dr. Wallace is a New York state licensed Psychologist and tenured Professor of Health Education in the Department of Health and Behavior Studies at Teachers College, Columbia University. She was the first African American woman to move through the ranks and gain tenure in the 100 year history of Teachers College in Morningside Heights—doing so in 1994. 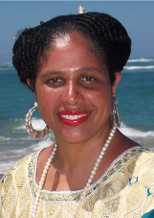 Her prior background includes graduating from Princeton University (AB, 1980; Major: Psychology, Certificate in Afro-American Studies), the City University of New York (Ph.D., 1985; Clinical Psychology), and post-doctoral training with NDRI (Narcotic and Drug Research, Inc., now National Development Research Institutes). Dr. Wallace has been honored by the American Psychological Association with the status of Fellow within both Division 50 (Addictive Behaviors) and Division 45 (Society for the Psychological Study of Ethnic Minority Issues). Dr. Wallace’s books include the following: Crack Cocaine: A Practical Treatment Approach for the Chemically Dependent (1991, Brunner/Mazel, Inc.), The Chemically Dependent: Phases of Treatment and Recovery (Editor, 1992, Brunner/Mazel, Inc.), Adult Children of Dysfunctional Families: Prevention, Intervention and Treatment for Community Mental Health Promotion (1996, Praeger Publishers), Understanding and Dealing with Violence: A Multicultural Approach (with Co-Editor Robert T. Carter, Ph.D., 2003, Sage Publications), HIV/AIDS Peer Education Training Manual: Combining African Healing Wisdom and Evidence-Based Behavior Change Strategies (2005, StarSpirit Press), and Making Mandated Addiction Treatment Work (2005, Jason Aronson/Rowman & Littlefield). A new edited volume, From Health Inequity to Equity in Health: A New Global Approach to Health Disparities (Springer Publications) is in progress (for release summer 2007). She is an Editor-in-Chief of the new electronic Journal of Health Inequity to Equity in Health, being launched in 2007. Dr. Wallace has published numerous journal articles and chapters in edited books. Dr. Wallace is available to serve as a regional, national, and international consultant. She travels widely as a keynote speaker, conference presenter, and workshop leader, covering numerous topics: health disparities; multiculturalism and diversity training; adaptive versus maladaptive coping to the stress of racism/oppression/diversity, using her new package of research measures; training trainers of HIV/AIDS peer educators and HIV/AIDS prevention; the community forum model as an intervention for communities in crisis and for community empowerment; repealing harsh laws/legislation contributing to the massive incarceration of drug offenders; making mandated addiction treatment work as an alternative to incarceration; chemical dependence treatment; relapse prevention for a range of addictive/problem behaviors; treating the dually diagnosed; violence prevention; and, trauma resolution for sexual and physical abuse and domestic violence. As the Founder/Director of the Research Group on Disparities in Health within the Department of Health and Behavior Studies at Teachers College, Columbia University, she supports the work of graduate students, post-doctoral fellows, and colleagues. The includes conducting a Research Seminar that brings together fellows and colleagues. Dr. Wallace also Directs the Annual Health Disparities Conference at Teachers College, Columbia University. Within Akan culture, enstoolment (being placed in a position as an African Traditional Ruler) is one of the highest honors one can receive. Dr. Wallace was enstooled as a Queen Mother (African Traditional Ruler) in 2000 at Larteh Ghana. She is now also known as Nana Ohemaa Agyiriwa, II—the Abradehemaa, and is actively involved in philanthropic activities to support health, education, and economic development in Africa; this work includes building an HIV/AIDS Peer Education Training Center, raising funds to build/renovate schools and for student scholarships, as well as editing books pro bono that are used for fundraising for projects in Africa. Copyright © 2006 The Research Group on Disparities in Health.